Securing a Fair Trial Through Exclusionary Rules: Do Theory and Practice Form a Well-Balanced Whole? This chapter describes practitioners’ understanding of excluding illegally obtained evidence. To gain deeper insight into the applicability of the exclusion of evidence obtained through illegal means and to evaluate regulations that have been implemented, fourteen experts from different legal professions (lawyers, judges, prosecutors) and countries (Germany, Singapore, Switzerland and Taiwan (ROC)) were interviewed about their experiences. All legal systems are faced with the use of illegally obtained evidence. Based on qualitatively analyzed data the frequency of the applicability of exclusionary rules, the types of cases in which they are seen, and experts’ attitudes towards the function of exclusionary rules are described. Violations of rules around the gathering of evidence is a highly sensitive topic, particularly as the state (represented by police officers and prosecutors) plays a central and powerful role. To find out if exclusionary rules do indeed result in a more impartial trial or if further protective measures are required, factors influencing the procurement of evidence and the decision-making process around the legality of such procurement were evaluated. Subsequently, difficulties that law enforcement agencies and criminal courts are faced with were outlined, with an emphasis on the application of the law and the limitations in safeguarding criminal investigations and proceedings. Concluding remarks highlight best practices in securing a fair trial as well as ancillary measures (including unwritten techniques) that may be utilized to optimize the utility of exclusionary rules. The project “Securing a fair trial through excluding evidence? A comparative perspective” fulfills the need to determine features of the criminal process that are conducive to enhancing respect for human rights in different legal and cultural environments. The legal situation is described in the country reports in the previous chapters. But how do exclusionary rules function in legal practice? Does practitioners’ understanding of excluding illegally obtained evidences comply with the law? What are experts’ experiences concerning the applicability and frequency of exclusionary rules in criminal proceedings? Are techniques of taking evidence that are forbidden really not used? How can violations be proved? Where do the experts identify gaps of protection, limitations of exclusionary rules and possible safeguards? Which potential alternatives and supplementary means of nudging law enforcement are identified? What ancillary measures (also not written ones) may be utilized to make exclusionary rules effective? To gain a deeper insight into the applicability of the exclusion of evidence obtained by illegal means and to evaluate implemented legal regulations, experts from different legal professions and countries were interviewed about their field experience. The aim of the interviews was mainly explorative and partly theoretical-based. Explorative interviews seek to get information about the research field, the experts’ knowledge about their business as well as about their contextual knowledge.1 Results from qualitative research based on a small number of interviews are not representative and do not allow for any generalization or statistical extrapolation.2 Nevertheless, the results provide an insight into the application of exclusionary rules, the evaluation of existing measures, potential gaps of protection and alternative measures to secure a fair trial. The expert interviews were conducted using a qualitative interview guideline. Semi-structured interviews are appropriate to get open answers, to describe a problem and to access the implementation of legal regulations.3 It is in the nature of things that for explorative aims, standardized questions could hardly be formulated. Guideline-based interviews enable the interviewer to encourage the expert to report complex issues and to cover different perspectives of the research question.4 Therefore, the guideline included several questions to induce reporting, but also some hypothetical questions to explore the expert’s attitude towards potential problems. The guideline also enabled the interviewer to follow a common thread of topics, which is important to analyze and compare the given information and perspectives.5 The guideline also included some standardized detailed questions to ensure that certain questions were asked. If not discussed in the interview, these questions were then discussed at the end of the interview. In the following study, fourteen interviews from Germany (5), Switzerland (2), Taiwan (ROC) (4) and Singapore (3) were included. The interviews were conducted in the years from 2015 to 2017. Depending on specific circumstances, interviews lasted between 27 and 80 min with an average duration of 48 min. The sample of experts covered all legal professions and included five judges, three prosecutors and three lawyers with long-term experience (at least five years) in the field of criminal law and criminal proceedings. (Police officers or police investigators were not questioned). Each professional group plays a special role within criminal proceedings and were able to describe the applicability of securing a fair trial from a different perspective. Several experts have worked in different legal professions, with professional experience as a prosecutor, judge or lawyer. The change of professional positions enabled the affected experts to obtain insights in different positions from different points of view, which made them valuable for explorative expert interviews. Experts were selected from European and Asian countries with different legal systems. Access to the sample of interviewees was possible due to personal contacts by the project team in Germany, Switzerland, Taiwan (ROC) and Singapore. The guideline-based interviews were conducted in German and English, the Taiwanese ones were partly discussed in Chinese and translated into English by a member of the project team familiar with the aims of the interviews. An extraordinary challenge occurred by conducting the interviews in different languages, particularly in interviews, in which neither the expert nor the interviewee were native speakers. To mitigate content-related problems due to language difficulties, the interviews were conducted by members of the project-team familiar with the legal situation in the expert’s country and, if possible, with the expert’s language.6 The interviews were audio-recorded and transcribed. To ensure anonymity, interviews are cited by using the country and a number. 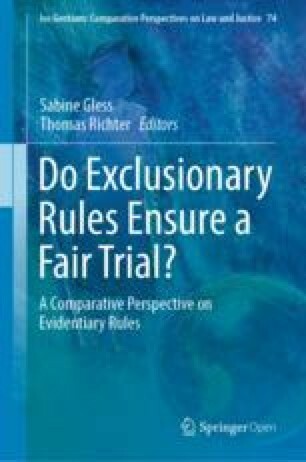 The function and role of exclusionary rules within criminal proceedings: If exclusionary rules secure a fair trial, it is essential to get information about the frequency of their applicability, the kind of cases they cover and the experts’ attitudes towards the function of exclusionary rules (Sect. 3.2). Difficulties and limitations: This part examines legal difficulties in applying exclusionary rules as well as limitations to obtaining evidence legally. To evaluate if exclusionary rules secure a fair trial or whether further protective measures are required, it was necessary to know which factors and decisions influence the procurement of admissible evidence (Sect. 3.3). Compliance with rules to obtain evidence: As norm compliance and prevention require awareness, the awareness for exclusionary rules in criminal proceedings was considered in a first step to evaluate compliance with exclusionary rules and rules to obtain evidence. Secondly, possible motivations for norm compliance in the field of obtaining evidence were discussed to examine which measures were suitable and effective to secure a fair trial, and whether, for example, exclusionary rules could be strengthened through additional protective measures (Sect. 3.4). 3 Do Theory and Practice Form a Well-Balanced Whole? In legal theory, exclusionary rules are implemented to secure a fair trial. But do theory and practice form a well-balanced whole? Do exclusionary rules secure a fair trial or is their applicability limited? How can a fair trial be secured? In other words: which strategies can be applied to ensure evidence is obtained legally? In order to regulate criminal proceedings and to secure human rights within proceedings, governments establish laws and rules, for example exclusionary rules, which should be observed by police, prosecutors and judges. The rationale behind exclusionary rules is the expectation that law enforcement officers will refrain from employing prohibited evidence-gathering methods if they know that physical and testimonial evidence obtained by illegal methods will be excluded. It is assumed that they will realize that using such methods will not contribute to convicting the suspect and are therefore useless. But how can compliance with the law be achieved? Which factors motivate people to comply with rules? Referring to social psychological theories, people can be intrinsically or extrinsically motivated to comply with existing rules. People’s compliance with the law can be obtained through deterrence strategies (so-called instrumental strategies), which means that individuals are afraid of punishment (referring to the idea of general prevention), for example consequences under criminal or labor law. As an action theory, the rational-choice-theory is inter alia based on the assumption that people balance advantages and disadvantages before deciding how they react. Referring to the rational-choice-theory, potential offenders are deterred from violating rules, if the costs of criminal offences are higher than the advantages.9 Based on this idea, the situational crime prevention theory proposed measures that reduce the opportunity for crime and increase the risk of detection, for example through control measures or surveillance (e.g., audio- or video-recording of interrogations, interrogations conducted by at least two officers or physical examination of an arrested person).10 Yet, it is assumed that besides rational choice, normative considerations also play an equally important role in the willingness of people to comply with the law.11 Enforcement of legal rules is linked to people’s attitudes towards trust in justice, legitimacy, but also to the acceptance of a rule, which in the case of exclusionary rules is the legal taking of evidence respecting the suspect’s rights. The acceptance of a rule is, therewith, one key precondition for norm compliance.12 In this context, Tyler pointed out: “If people view compliance with the law as appropriate because of their attitudes about how they should behave they will voluntarily assume the obligation to follow legal rules”.13 Following this approach, the acceptance of rules depends on the individual’s attitudes and conviction that a rule is morally legitimized.14 To achieve the acceptance of legal rules, people have to be convinced of their moral alignment with the rule, for example through training measures, educational work and communication between all actors concerned. While instrumental compliance includes external factors and people’s self-interest not to be detected and punished, normative compliance focuses on the acceptance of a legal rule and its legitimacy, even if norm compliance is not to their own advantage.15 Referring to these theoretical ideas, the following section examines the hypothesis that exclusionary rules as an instrumental strategy secure a fair trial. The following chapter describes challenges that law enforcement agencies and criminal courts are faced with, particularly concerning difficulties in applying the law and limitations of safeguarding criminal investigations and proceedings. Next to the abovementioned difficulties of the legal applicability, exclusionary rules are faced with several limitations. Some limitations, particularly an assumed dependence on subjective assessment by courts, judges, prosecutors or police officers, are inherent in the legal system. They particularly appear in cases of balancing competing interests: the guarantee of valid information on one hand and inalienable rights of the suspect on the other hand.47 Despite the legal need for an extensive balancing of arguments, information and evidence, experts from all countries pointed out the imponderability of a balancing procedure.48 During the criminal proceeding, the careful balancing of exclusionary rules includes risks of wrong decisions being made.49 For example: where does the effect of coercion end? Where is the line between legal and illegal influence through tactical interrogation by police officers or prosecutors?50 Which information collected by police officers is comprised in a case file? Generally, police officers preselect the information included in the file.51 It is not predictable, how evidence is evaluated by the judge or prosecutor52 and to which extent a prosecutor, police officer or judge is influenced by the impression of a suspect, when the credibility of an accused person has to be examined. The question of the extent to which a suspect can and should be protected is closely connected to the provability of inducement and/or threat. Situations where a suspect is questioned without being informed of his/her rights could occur, for example, when he/she waits in the police station and smokes with officers or when he/she is driven to be taken into custody in another city.58 One expert recounted a case in which a bound suspect (hand and foot cuffs) was not properly fastened in the car so that he lost his balance.59 Who is responsible and takes care in such a situation? Could such a situation be misused by officers to maintain inducement? In the mentioned case, the judge responsible for the pretrial detention investigated the assertion, spoke to the involved officers and discussed solutions.60 But the judge had to trust the officer and could not control whether something else happened during the ride. Threats or inducements were not claimed, but could be easily expressed or maintained in nearly all situations (for example the abovementioned arrest through special police forces). The described limitations take place at a human level that can be influenced and standardized, but lawyers, courts and prosecutors should be aware of limitations. Challenges referring to provability and the extent of protection could be solved by legal rules or using new techniques like video or audio taping, physical examinations after arresting someone or control measures.67 Others limitations are dependent on balancing and the attitudes of the people deciding. All legal systems are faced with deviance. Deviations from norms ultimately enhance for social cohesion and justify the legitimacy of the criminal law and state-run institutions like prosecutions service and criminal courts.68 As a matter of fact, use of illegally obtained evidence is possible in each and every legal system. Violations of rules to obtain evidence are a highly sensitive area, as the state, represented by police officers and the prosecution service, has an overpowering role. The following chapter deals with awareness for exclusionary rules, possibilities of contributing to norm compliance and the discussion of measures suitable to safeguard proper evidence procedures. Finally, the experts were asked about consequences after evidence was illegally obtained and possible incentives to stop public officials from illegally obtaining evidence. Are exclusionary rules sufficient safeguards or are further safeguards during criminal proceedings necessary? The experts agreed that police officers are well-educated and endeavor to comply with the law, but legal regulations are sometimes confusing and their application in stressful situations can be difficult.93 Problems particularly occur if small local police stations are responsible for everything.94 Some police headquarters offer internal trainings for difficult issues arising in criminal proceedings.95 Legal training of police officers and communication with police officers were seen as important measures, not only to educate police, raise awareness for exclusionary rules and provide a fair trial, but also to reduce prejudices against judges and prosecutors, to develop an understanding for their (ex post) decisions, to demonstrate social control and to reduce the officer’s potential frustration by explaining the reasons for a decision.96 Communication and education cannot replace exclusionary rules, but enhanced attitudes could influence the acceptance of norms, procedural justice and norm compliance. Do theory and practice form a well-balance whole and are practitioners concerned about possible limitations and difficulties related to exclusionary rules? The interviewed experts agreed that the use of illegally obtained evidence before courts is rare and that torture and other undue coercion are an exceptional phenomenon. In particular, the German experts pointed out the police officers have usually internalized the principles of the rule of law. Despite all safeguards, every system is nevertheless aware that a suspect’s rights may be violated, for example through undue coercion on the way from a police station to court or jail. When accusations of illegally obtained evidence are raised, judges have to balance the competing interests and arguments of both sides. Compliance with the law depends on control measures and the threat of legal consequences, but also on attitudes and awareness of investigating officers. Therefore, proper training and the use of internal incentives amongst police and investigating officers are considered more useful than more detailed and complex exclusionary rules. On the other hand, measures like audio and video recording as well as physical examinations and the participation of lawyers can help control officers and enable accused persons to prove claimed illegal behavior. In conclusion, it can be said that despite the existence of some loopholes, exclusionary rules—when accompanied by protective, deterrent and educational measures—do provide the basis for a fair trial. Gläser/Laudel, 2010 at 116 and 145. Bogner/Littig/Menz, 2014 at 44 et seq. The German term “Inhaltsanalyse” was translated as “content analysis”. It includes a qualitative text analysis without quantitative elements. Gläser/Laudel, 2010 at 197; Mayring, 2002 at 114 et seq. Becker, 1968 at 207 et seq. Clarke, 1997 at 4 et seq. See Tyler, 1990; Lind/Tyler, 1988. Bottoms, 2001 at 90; Jackson et al., 2012 at 1053. Ch_01, Sec. 4; Germ_02, 01:05:00; Germ_03, 01:16:01; Sing_02, 01:03:51; Taiw_02, 00:41:37. Ch_01, Sec. 4; Germ_02, 01:06:13; Germ_03, 01:24:06; Sing_03, 00:33:51, 00:37:42; Taiw_02, 00:41:16; Taiw_03, 01:10:37. Germ_02, 01:05:00; Germ_03, 01:16:01; Germ_05, 00:13:11; Sing_02, 01:03:51; Taiw_02, 00:41:37. Ch_01, Sec. 8; Ch_02, 00:02:33; Germ_01, 00:01:14; Sing_02, 00:04:11; Taiw_04, 00:03:06. Germ_01, 00:08:41; Germ_02, 00:56:49; Germ_04, 00:04:42. See Weigend, National Report Germany. Ch_01, Sec. 6; Germ_04, 00:04:42; Germ_05, 00:18:56. Germ_01, 00:02:21, 00:44:57; Germ_03, 00:03:15; Germ_04, 00:04:42, 00:05:53; Germ_05, 00:05:24, 00:10:09; Taiw_02, 00:14:18, 00:23:33; Taiw_03, 00:29:48, 00:43:22. Schweizerische Strafprozessordnung vom 05.Oktober 2007 (Stand am 01. Januar 2018) (SR 312.0). Germ_04, 00:18:14; Germ_05, 00:18:56; Sing_01, 00:22:48; Sing_03, 00:18:31. European Court of Human Rights (ECtHR), Frucht v. Germany, case no. 54648/09, Judgement (5.Chamber) of 23 October 2014 at § 68. Germ_02, 01:08:54; Germ_03, 01:35:15; Sing_01, 00:22:48; Taiw_03, 00:52:20. Ch_02, 00:39:25; Germ_05, 00:15:22, 00:15:53. Lamnek, 2007 at 44 et seq. Ch_02, 00:10:22, 00:11:05; Germ_01, 00:15:30; Germ_02, 00:52:44; Germ_04, 00:11:48; Taiw_01, 00:54:11. Germ_02, 00:52:44; Germ_03, 00:21:54; Ch_02, 00:59:48, 00:59:51; Sing_01, 00:14:54, 00:45:34; Sing_03, 00:45:02; Taiw_03, 00:55:27, 00:56:43; Taiw_02, 00:23:33. Ch_02, 01:00:53; Germ_04, 00:59:50; Sing_03, 00:45:02; Taiw_01, 00:58:32. Ch_02, 01:02:53; Germ_04, 01:04:18; Sing_01, 00:47:53; Sing_02, 01:15:55; Sing_03, 00:47:01; Taiw_01, 01:04:13. Germ_04, 00:18:14, 00:47:14; Germ_05, 00:13:11. In Singapore, the audio- and video-recording was implemented as a pilot project. Taiw_02, 00:36:13; Taiw_01, 00:36:09, Taiw_04, 00:50:05, Sing_02, 00:48:31, Sing_03, 00:11:48. Sing_01, 00:20:03, Sing_02, 00:48:31, 00:49:44, Sing_03, 00:11:48.